If you buy records on e-Bay, you probably have heard of Marthy Coumans. And there are many other ways you might have heard of him. He deejays, runs a record label, writes articles and used to be in a band The Four One And Only’s, for which he wrote all the songs. He also has one of the best record collections that I know of. He sends me CD’s with some of his best finds every now and then. I will write about that later this year. Today I want to talk about a yearly radio show that Marthy and I do for Radio Breda. Marthy chooses a theme and then we both bring our best records. These are played one by one in between we talk about these records. Previous themes were Superfluous, Timeless and Mindbending. Last week we did this years show, with music that shows Honest emotions. As always Marthy and I had different interpretations of what that is supposed to mean, but I liked the show, and Marthy came up with some very cool records. He had an early Wesley Willis 45, Chronic schizophrenia , which I wish i could have taken home. And an LP by a man who was caught in a fire and came out with 90% of his skin burned away. After endless operations he made an LP with a fold out sleeve, showing pictures of the makeover. The songs he recorded are all in the I-am-so-happy-to-be-alive genre. I usually get the creeps of people who sings such songs, but in this case things are different of course. This was shocking. It made me wonder how the radio listeners would react on the show. Most shows on Radio Breda (and any other Dutch radio station) keep their listeners on a strict diet of middle of the road music and non-information, so it seems to me that listening on a Sunday morning to an hour of songs about suicide, murder, mental diseases and war crimes should have some impact at least. 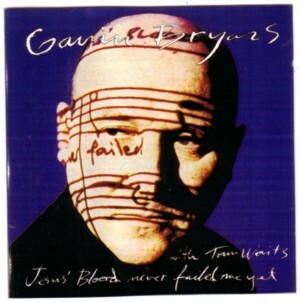 One of the tracks that I brought a long is from a CD that Gavin Bryars made in 1993. He had been given recordings of a tramp, singing a short fragment of Jesus blood never failed me yet . Gavin Bryars made a loop of that fragment and added some music to it. I heard it on the radio long ago, late at night, and got goose bumps. After a few minutes I turned on my tape recorder and recorded about 15 minutes of the track. The version on the CD lasts 27 minutes and it could easily have been made twice as long. There are also other versions on the CD: with a complete orchestra, no strings, low strings, full strings, and a version where Tom Waits sings along with the old man. The man died before he could hear the CD, writes Gavin Bryars. Here is one of the short versions.